The Iowa Events Center is the 6th location that I’m judging food at for the 2016 Dine Iowa Grand Tasting Gala event. This is my third year of judging for this event. Chef Robert Anderson and I are the main judges. It is a privilege to get to work with him, the IRA staff, and members from both the Soy andBeefCouncils. During the next couple of weeks, leading up to the October 6, 2016 event, we have 10 different restaurants to visit. These restaurants are all across Iowa. Rules: With this event, each competitor will prepare a main entrée recipe utilizing Braveheart Black Angus Beef Short Rib, donated by Performance Food Group (at least six ounces of cooked beef must be used). Additionally, each competitor will prepare a Tofu (soft-silken or water packed) side dish or sauce (at least a 1⁄4 cup of tofu must be used). Chef Chad Vander Ploeg has been with the Iowa Events Center for 6 years and has had a lot of great experience which was shown in the creativity of this dish. The dish was Tunisian/North African and focused on a lot of spices and took a lot of work to prepare. 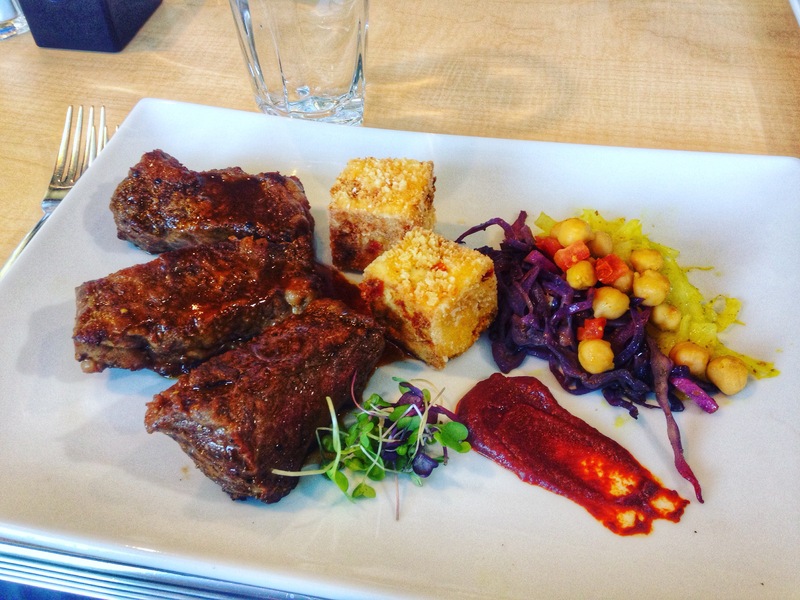 The plate consisted of short rib with a Tunisian Beef Stew called liftiyya, and seared harissa tofu and a Tunisian cabbage. The short ribs came out like a sirloin! It was very unique. The harissa was a sauce I had never had before but you could compare it to a sriracha flavor. In the image above, it is the red sauce spread on the plate. It consists of plenty of chilies, cumin, coriander and several other ingredients. Another unique part of the dish was the harissa tofu. It consisted of corn starch, extra firm tofu, and a half cup of the harissa sauce. It was a very creative dish and I loved trying a recipe from Africa! If you’re interested in trying this dish, you can order it off of District 36’s menu, or attend the Iowa Restaurant Association Grand Tasting Gala.